Full-size light-duty pickup trucks might be the best-selling vehicles here in America but sometimes the job at hand demands something even more powerful and capable, and that's where heavy-duty models come in. Most manufacturers of full-size light duty trucks also offer heavy duty versions, and with Ford it's the Super Duty while Ram has the 2500 and 3500. There's a lot to consider when buying a truck these days, as times when a pickup was little more than a chassis, a bed, a two-door cab and a powertrain are long behind us. So, let's compare the 2017 Ford Super Duty vs. 2017 RAM 2500/3500 to see which take on heavy-duty pickups is most deserving of your investment. For the most part, styling probably isn't as important for heavy-duty truck buyers as it's going to be for those shopping for a light-duty pickup but it's still always going to be a consideration. There really isn't anything too unexpected or revolutionary to be found anywhere in this segment, so big, bold, rugged and macho is pretty much par for the course. However, something pretty monumental has happened for the 2017 model year, and that's the Ford Super Duty getting its first complete redesign for what's now an incredible 17 years. The Ram 2500 and 3500 certainly look the part, that's for sure, but the Fords have now stolen a march with a more refined and substantially more contemporary look with this all-new model. The Ford has had its macho grille dialed down a couple of notches to something that's perhaps a little more butch. The twin horizontal "power bars" are now closer to each other, they have Ford's C-shaped headlights that are no longer surrounded with chrome bookending them, and there's a "Super Duty" logo stamped into the hood. Newer designs are always likely to catch the eye more, and that's certainly the case here. Although heavy-duty trucks are primarily about capability and utility, there's nothing to say they can't be enjoyable places to sit in as well. If there's one area that really does separate these two it's what you find inside the various cabs, which in both cases come in regular, crew and super or mega formats. It's patently obvious when you're in the Ram that you're in what's primarily a working environment. It's not that the Ram interiors are unpleasant, but they do lack some of the refinement that's becoming increasingly popular with today's trucks. By way of contrast, the all-new 2017 Ford Super Duty now has cabs that can be anything you want, from a utilitarian work truck to something more akin to a luxury sedan. Higher specification models are adorned with quality hides and multi-contour seats that can even be specified with a massage feature, while lower trims come with practical, durable cloth and scratch-resistant plastics. Every version of the Super Duty from the XL to the Platinum trim has available vinyl floors to avoid grinding dirt into the plush carpets so the Ford has a clear lead over the Ram as far as interiors are concerned. The 2017 Ram 2500 and 3500 do offer three engine choices while the Ford Super Duty only has two, but that's where the advantage ends here for Ram. The standard engine in the 2500 and 3500 is a 5.7-liter Hemi V-8 that develops a useful 383 horsepower and 400 lb.-ft. of torque, but the Ford sees it and raises it with a 6.2-liter V-8 that produces 385 horsepower and 430 lb.-ft. of torque. A diesel option is obviously a must for this type of truck, so it's no surprise both the Ram and the Ford have impressive oil burners to tempt us with. The Ram has a 6.7-liter Cummings V-8 turbodiesel, which when mated to the AISIN six-speed automatic in the 3500 gets as much as 385 horsepower and 900 lb.-ft. of torque, but less in other models. 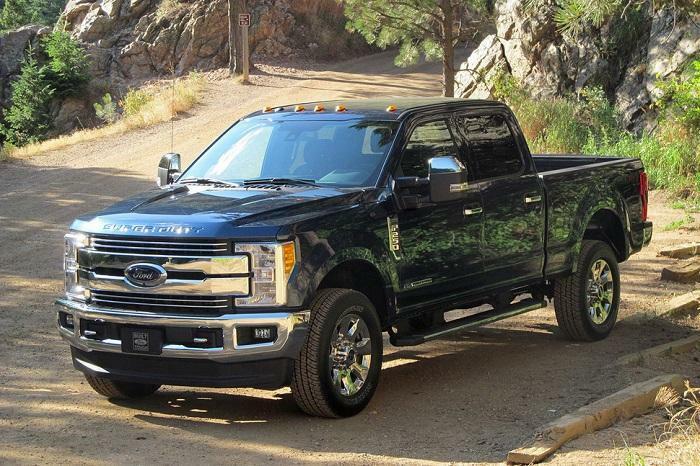 With the Ford it doesn't matter which model of Super Duty you choose, you're still going to have a massive 440 horsepower and 925 lb.-ft. of torque at your mercy with the 6.7-liter V-8 Power Stroke turbodiesel. The Ram does have a 6.4-liter Hemi gas V-8 option that gets 410 horsepower and 429 lb.-ft. of torque, but it doesn't dent the Ford's supremacy in this incredibly important area. There are lots of criteria to consider when buying a truck, but what it's capable of will probably be most important to the vast majority of heavy-duty truck buyers. 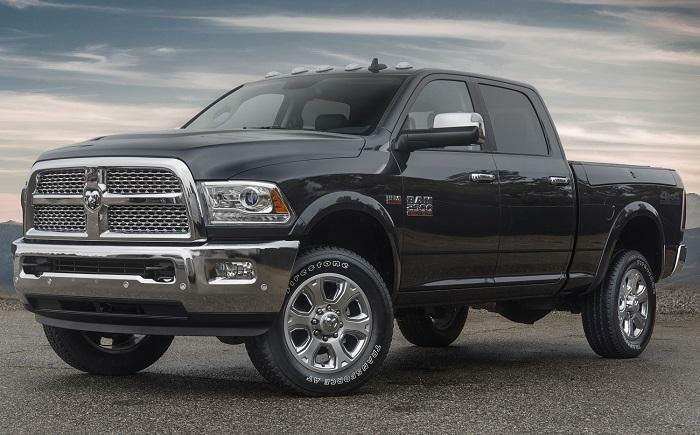 Last year the Ram might have given the Ford a run for its money in this key area, but not anymore. The Super Duty now boasts a maximum gooseneck towing capacity of 32,500 pounds, while fifth-wheel towing capacity is now a class-leading 27,500 pounds. It's the same story with conventional towing and payload capacity, which are also class-bests at 21,000 pounds and 7,630 pounds, respectively. To be honest, it's not really a fair fight anymore between the 2017 Ford Super Duty and its Ram 2500 and 3500 rivals as the new Ford is just better in every way. If we'd been comparing 2016 models it would have been a whole lot closer, but don't forget that version of the Ford had been around for almost 17 years largely unchanged. If you're in the market for a heavy-duty pickup truck, the 2017 Ford Super Duty is the one to go for without any doubt.